Random Noodling: Poetry Friday--I'm Back! I couldn't "not" write, but I may nap this afternoon! This is lovely, Diane, change in the future? I enjoyed our time together this week, sorry it passed so quickly! Happy Weekend! And thanks for sharing my link! I like that photo! Glad you had a safe and enjoyable trip, and I look forward to hearing more about what you learned. Thanks, Jama. I didn't take many notes--I hope Linda did! The most important thing I learned is to write the "unexpected." I took a few notes. If there's anything to share, Diane I will let you know. Yes.... The surprise in the poem. I loved learning, working, and refining with you, Linda, Charles, Pamela and went. A perfect combination of challenge and support. Rebecca Kai Dotlich and Georgia Heard are wonderful to learn from. Your Haiku is grand! I'd like to think I that I'd refer to notes, but I rarely do, and that's why I take so few. Thanks for your offer to share, Janet! It was fun to watch the group bond. 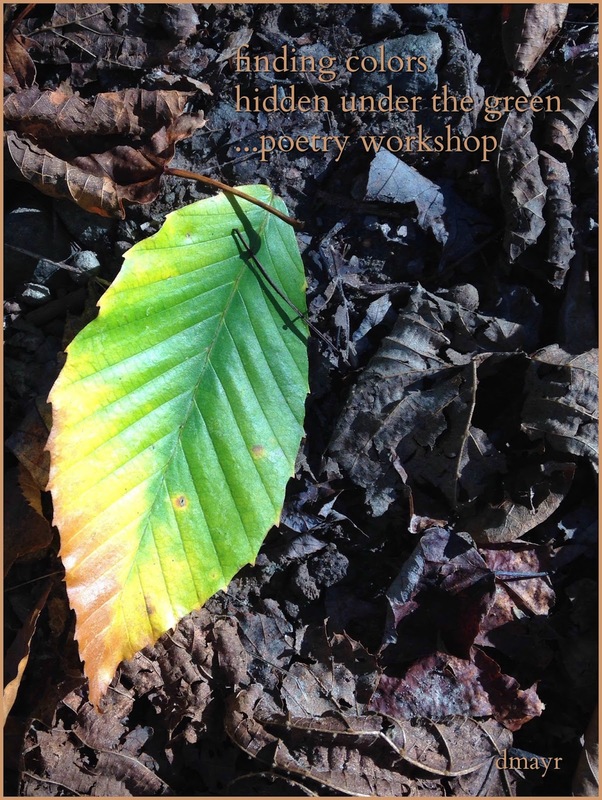 Wonderful....a Highlights workshop is fuel for many, many, many poems. Fortunately, once the coal is lit it burns a long time. I'm so looking forward to hearing more and seeing your work. The kindling has been light enough! I saw it on FB--lovely Mary Lee! I like your crafting a poem comparison. A lot of meaning in that color. Well done. That leaf is striking with its vivid colors against the brown path. I hope we get to hear more about your week. I'll have a post next Friday! I am sure this was such a special trip! I have met Linda before and she is such a delight, so I can imagine what a fun learning experience this must have been. Besides working on poetry craft, I got to build a few friendships. It is a hard time of year for teachers to get away, and, it's a huge outlay of cash, especially since you'd be flying. But one thing I will say--you are worth it! How wonderful that you were able to celebrate poetry with some of our writing friends, Diane. You found the color popping through throughout the week, literally and figuratively, I am sure. I like your poetry workshop being green, and the bright contrast works well with the image too Diane. Sounds like it was a rich workshop, I look forward to hearing more about it, thanks!